After coming down from my ten performances of ‘A Robinson Crusoe of the Soul’ I launched into looking into ways of staging it in south Wales. This has proved frustrating and glacially slow. I could grow carrots, cabbages and onions, breed and milk my own cows, make and market my own cole slaw, it would be easier and quicker than getting someone, anyone, in the Welsh arts world to give me even the tiniest leg up. I don’t blame individuals, it’s not a great time for the arts anywhere. Austerity, and all that. Brexit, blah blah blah. People have other things on their mind. Frustrated, and trying to keep the Robinson plate spinning, I came up with the thought that I could use the style of that show to create a series of podcasts. The last few years have been very depressing – the UK seems to have become a nation of boring, ultra-conservative, vitriolic, xenophobic philistines in gullible awe of privileged self-serving bullshitters like Rees-Mogg and Johnson. I needed to turn away from it, face a different direction, it was destroying my soul. I wanted to look at this country and find something I love. So I’ve started on a series of podcasts ‘These Weird Isles’ – a journey around less well known parts of the UK, layering memory, landscape, and the work of others who have passed the same way. There’s Batman and Gwen John in Haverfordwest, Peter Cushing in Whitstable, there are curlews and plenty of cheese. Search ‘These Weird Isles’ on iTunes, Spotify, Stitcher or Soundcloud. Or, if you can’t find them there, they’re here. I performed ‘A Robinson Crusoe of the Soul’ for ten dates over two weeks at the Edinburgh Fringe. I described it as ‘dirty, noise opera’. A messy mix of sound, prose, music and nonsense. A solo show I wrote, produced and performed on my own, as stupidly arrogant as this may have been. I write this now it’s over, knowing now how blissfully unaware I was of how difficult it would be. The orgnaisation alone, from booking the right venue, to ensuring I had enough twenty pence pieces in a jam jar for the parking meter, was enough to have me crawling around on all fours slobbering. But these were things I knew about. What I could not have forseen were things like the entrance to the venue car park being blocked by a laundry van and there being nowhee else to park. 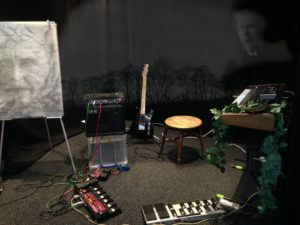 I could not imagine how something I had run through over and over again – setting up my equipment, making sure all cables and connections worked, tuning instruments, sound checking, would be so much more difficult when the previous performer overran. With seconds to go before my audience was shown in, I would still be making final adjustments, unsure everything was working, the venue humid, my head, face, body, sweltering, pouring with sweat. And this was before any performance began. A performance is the tip of an iceberg, in this case an iceberg that is melting at a furious rate. What the audience don’t see is the huge amount of preparation, the years of writing, composition, organisation, and particularly, last minute, frenzied, furious mayhem. And then there was one negative, almost hostile, response from a professional reviewer, who I shall not name, who suggested audiences would have felt ‘short changed’ when my show ended ten minutes earlier than I had assumed (shows were of varying length because so much was improvised). No audience member complained that my show was too short, although one gentleman walked out because it was too loud. I received no negative audience feedback at all. Yet this reviewer (who didn’t pay for his ticket) managed to tainted my (maybe unwarranted) pride at having pulled off what was a gargantuan task. Just finding somewhere to park, to load my gear, climbing up and down two flights of stairs three times a day, to load the car, then getting to the venue unsure of whether I could get my stuff out of the car and inside on time, every day, was self-inflicted torture, and enormously demanding even without having to give everything to the show. But it is done. Maybe I’ll perform it again in a few months. We’ll see. I’m a wreck.